What’s your association with Abruzzo? i.e. where do you live and why? Where did your family come from and when/where did they emigrate to? How long have you been living in Abruzzo or visiting? Two years ago my partner and I started exploring the possibility of opting out of UK culture (of all work and very little else) to share our passion for the mountains and outdoor sports. Having spent some time over the last few years touring Italy by bicycle, we felt that this country may hold what we were looking for, but where? We’d never heard of Abruzzo. It was a wrong turning in Umbria that brought us to this region of wild mountains & raw beauty where we got the “Wow!” factor; we just had to explore further. 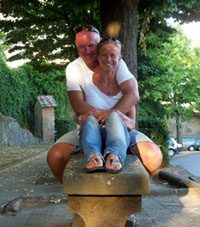 We spent 3 weeks exploring the likes of Liguria, Tuscany and Lazio but it was Abruzzo and the Abruzzese that truly captured our hearts. We explored the three equally fabulous national parks, but kept being drawn back to the Majella its villages and people. With its 740.95 km² of wilderness, tracks, trails, skiing and climbing, not to mention Monte Amaro with its impressive peak at 2793m, the Majella represented everything we were looking for. 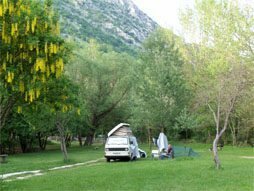 At the end of last year we eventually found the perfect spot in Serramonacesca on the stunning north-eastern slopes of the Majella to set up Kokopelli Camping for other like-minded outdoor enthusiasts. What’s the best thing about Abruzzo? Every single day I am in breath-taking awe of the endless beauty of the region. Whether you are on top of the world on one of the highest peaks, wandering through the dappled sunlight by the waterfalls and pools of the beech woods, being startled by a cinghiale in the spring or following the footprints of a bear in the snow, every day, every season has its own magic. But it is the people of Abruzzo that truly give it the uniqueness that it has and deserves. Very proud of their land, families, language and traditions, the Abruzzese have somehow managed to cling on to what is really important – their family links and tight sense of community. That said, their naturally curious nature, sense of fun and over-whelming kindness means that you will always receive a friendly face and a very big welcome. What’s the worst thing about Abruzzo? There is just so much here and so much going on all the way across the region, but it is so hard to find it! We’ve been here for 9 months now and are very aware that we are simply scratching the surface. Despite diligent research and searching, almost everything we have found we have either stumbled across accidentally, or been shown by the locals. Holiday makers (if they find their way here at all) will miss so much. Tourist information is very scant, very biased towards the cultural sites and centres, and difficult to find in a language other than Italian. Tourist offices are often closed and information is out of date. Local businesses and Comunes just don’t seem to realise what they have and how to promote themselves. We have had some fantastic nights out in the local bars, listened to some great live bands, eaten superb food and joined in with guided walks, all with amazing hospitality and easily within 10km of our home. Yet very few outside the locality even know these things exist. What’s the most underrated thing about Abruzzo? The climbing in Abruzzo is vast and it is spectacular but very few, even within Abruzzo itself, know it’s here. Information again is scant with most of it out of date and there are many, many more routes to be opened up. Until this summer, the only climbing guidebook that was available was written over 15 years old and could only be bought in a bar in Roccamorice, providing you knew it was there! 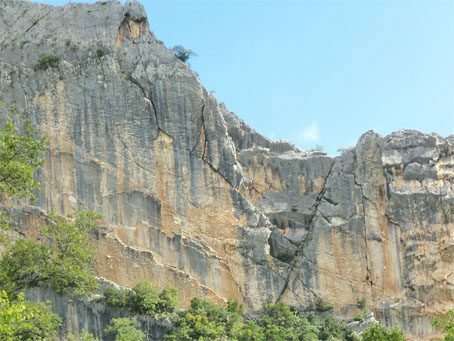 Abruzzo has the potential to be a climbing area that could rival any in Europe, and we also have some superb climbers in our midst. Giorgio Ferretti’s You Tube of Pennadomo climbing gives a jaw-dropping view of just what we have here. But things are improving. Old routes are being re-bolted, new routes are being opened up and a new climbing guide, Abruzzo Verticale, has actually just hit the bookshop shelves. 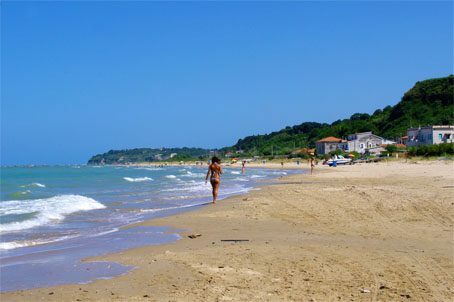 Where would be your favourite place to live in Abruzzo? I really don’t think anywhere in Abruzzo could match what we have found here in Serramonacesca. We have a vibrant community with a great mix of young and old, two lively bars, two shops, a butcher, chemist, a restaurant and another about to open. Serra is within the Majella National Park and boasts some of its most spectacular walks with many waterfalls and plunge pools. 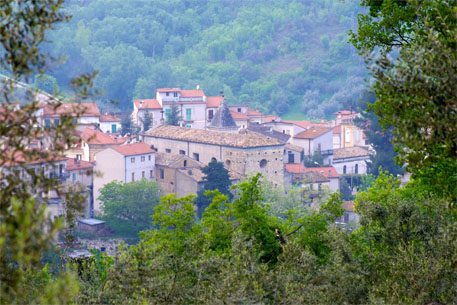 It has the abbey of San Liberatore, the fascinating archaeological ruins of Castel Menardo and the hermitage of St Onofrio, all within walking distance of the village. On top of that, add the many overflowing festas, the rock concert, the sagre & events (see below) and you have the perfect recipe for a spirited and dynamic community with a great big heart. Where would you not live in Abruzzo? What’s your idea of a perfect weekend in Abruzzo? To start the weekend on a Friday afternoon with an early down tools, hit the beach, locally known as “Pomodoro Spiaggia” for an hour or two of swimming, chilling and watching the kite surfers as the sun goes down. An early seafood supper in one of the basic, but absolutely superb, restaurants on the beach would round the evening off perfectly and be a great start to the weekend. Saturday would be spent climbing all day at any of the Majella crags: Roccamorice, Pennapiedimonte or Pennadomo would be absolutely ideal, particularly Pennadomo as there’s always the beautiful Lago di Bomba for a swim to finish off in. Saturday night always has to be the Parco dei Carpini in Roccamontepiano! There’s no other choice! 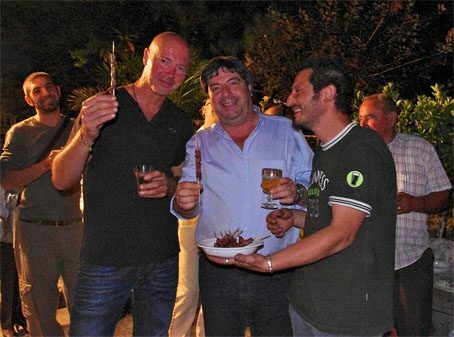 Great local bands, great arrosticini, great atmosphere, great people. After a Saturday night at the Parco, a Sunday lie in is always to be relished! Not for too long though as a long, sweeping, bike ride winding our way around the empty roads between Serramonacesca, Pretoro, Fara Filiorum and Chieti will be calling. A late lunch (or early supper depending on the length of the lie-in!) of simple but stunning Abruzzese cooking will be taken at either Le Chateau de Ma Mère in the summer (beautiful terrace dining), or Lu Gattone of Mannopello when the weather’s a little more chilled (warming, homely, cooking). What’s your favourite Abruzzo vineyard and why? Roxan – Casa Vinicola. It’s local, it’s passionate and its wines are superb. Good value too, always a bonus! Abruzzo Santo Spirito, Roccamorice (PE): for a delightful and delicate lunch after a walk in the woods surrounding the Eremos of San Bartolomeo and Santo Spirito. Osteria del Contadino, Manoppello Scalo (PE): Superb food – simple, but a little bit different, Abruzzese cooking with a passionate focus on meat. Always a great atmosphere, constantly busy and buzzing no matter what day of the week. Plenty of space too, either outside, in the conservatory or within the restaurant. A restaurant for all seasons! Have you a favourite sagra? The Festa Nazionale degli Gnomi, San Liberatore, Serramonacesca: three days of magic, fantasy, fairies, goblins and gnomes in the fabulous setting of the San Liberatore. 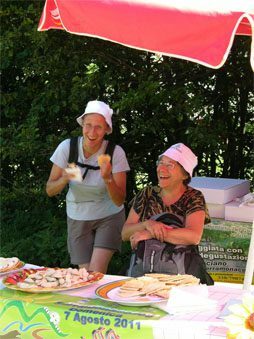 The Magna Majella: A feast of a walk! A huge event on the Serramonacesca calendar, the Magna Majella is a long, guided, annual walk in August going from the top of Passo Lanciano all the way down to Serramonacesca through the ancient woods and plains of the north eastern end of the Majella. 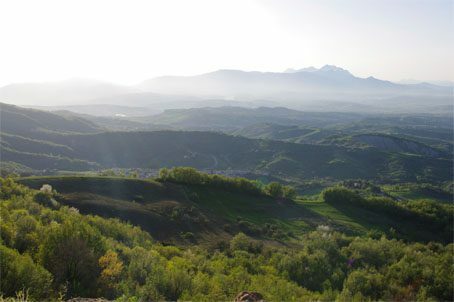 What’s your favourite view in Abruzzo? There are just so many, how on earth do you choose from a region that has the most stunning views every which way you look? But, if pushed, it would have to be the top of the world feeling, and sense of great satisfaction, from the summit of Monte Amaro. 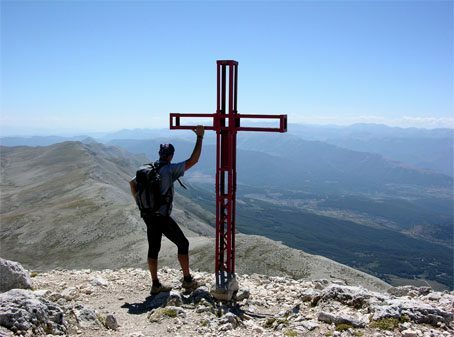 At 2793m and the highest peak of the Majella (second highest in Abruzzo and the Appeninnes range), its not an easy hike, but worth every step. What would be your favourite Abruzzo dish? I’m not sure if it is Abruzzese, but the Tagliata of the Osteria del Contadino in Manoppello Scalo is mouthwateringly superb: sliced, delicate, rare steak with parmesan and rocket, dressed in a blend of juices, garlic and lemon. What outdoor activities or sports would you recommend in Abruzzo and why? Of course that’s got to be climbing! There is just so much of it, and so much undiscovered. For experienced climbers there is the joy of having a whole limestone crag all to yourself, all day long, in the most stunning of settings. What’s your favourite Abruzzo village and why? Have you a favourite Abruzzo walk? The long circular walk of about 3-4 hours, starting from our Serra hamlet of Garifoli that takes you up onto the Montepiano, way, way above Roccamontepiano, down and then back up to the Torre di Pelegro and back down into the valley with the river, cascades, tombes and the Abbey. A stunning walk in any season with a fantastic diversity of wildlife, plants, herbs, birds and butterflies and views to take your breath away, over and over again. What piece of advice you would give to someone new to Abruzzo? • Other than in the larger cities, there is little choice of food other than typical Abruzzese peasant fare. Absolutely delicious in its simplicity, freshness, textures and flavours, but the lack of choice for those from other countries could be frustrating. • Everything and everyone shuts down at midday and nothing or no-one restarts again until 4-5pm. The whole place shuts down on Sundays. Which ‘must see’ event or activity best sums up Abruzzo? 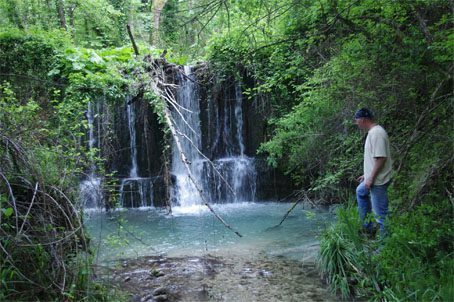 The Parco Nazionale della Majella offer many informative excursions into the Majella for anyone wishing to learn more, and dig deeper, into the heart of Abruzzo. Which book would you recommend people to read to understand Abruzzo? A tricky one as there’s very few English written guides out there and those that are there, barely scratch the surface. However, if you do truly want to get off the beaten track and discover Abruzzo for yourself, the new Cicerone Walking Guide to Abruzzo written by Stuart Haines is an absolute gem. What attitude best sums up the Abruzzese? If you lived outside Abruzzo what would you take to remind you of Abruzzo? My original tourist map of the Majella is never far from my side! Jacqui Dixon is the co-founder of the new small campsite, ‘Kokopelli Camping’ set in Serramonacesca in the province of Pescara that officially opens May 2012. In her spare time she enjoys participating and training for triathlons, rock climbing and hiking. Wow, I think you've just completely sold me on where to go on my next trip to Italy. Sounds like an incredibly beautiful place, and I will be following the campground opening.